Landscape lighting is an important part of any landscape, however it is typically one of the most overlooked parts of a landscape. 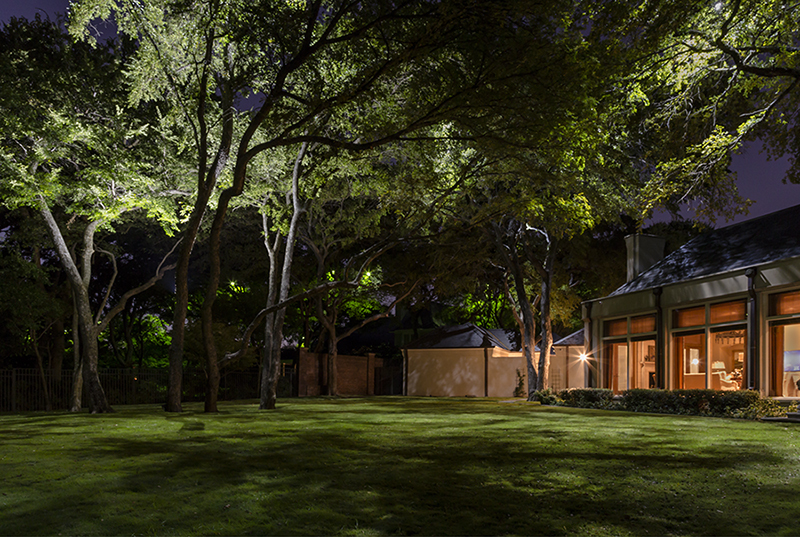 Not only does landscape lighting provide additional security for your home, but it also allows homeowners and guests to enjoy your outdoor space well into the night. Lets look at our top two cool landscape lighting ideas for your front yard. Typically most homes have a path leading to the front door, or even a path leading around to the backyard. Sure, it’s simple to walk up to the door or around to the back in the dark…but it’s much safer to have some type of lighting to lead the way. I’ve walked down quite a few paths in the pitch black, hardly able to see my hand in front of me…when *whack* a branch has made contact with my face. Not exactly how I would have anticipated walking to the backyard would go. 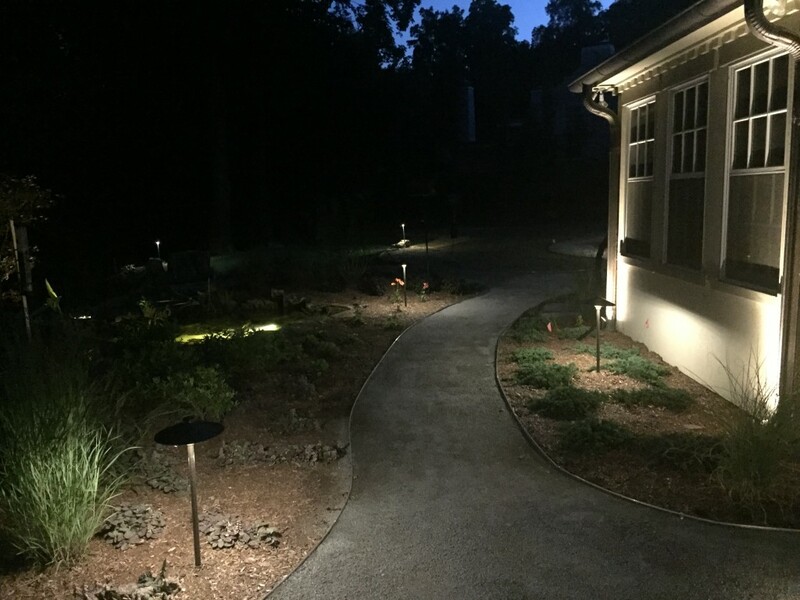 Path lights are perfect to light up darker areas of the landscape as well. I’m talking about you, dark landscaped corner in the back…you need a light because you freak everyone out! If we can get excited for a minute…lunar down lights are pretty much awesome landscape lights. The light is actually installed within the canopy of a tree, and then shines down to the ground, hence ‘down light’. Why are these so cool? So glad you asked! These landscape lights produce a ‘moonlight’ effect, but just a bit brighter. 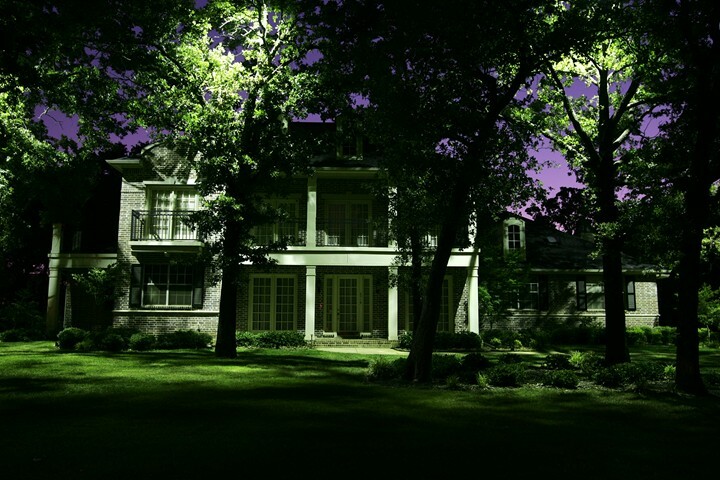 Anyone driving by will definitely notice your landscape with a lunar down light installed. They are perfect for the front or backyard, and great for a tree lined driveway. If you entertain frequently in your outdoor space, these produce just that right amount of light for people to mingle about, without straining their eyes. Just look at how cool these landscape lights look and how they produce that wonderful ambiance we are all in search of. All of the lighting we use, pond lights included, are all LED, which last longer and will save you in energy costs. With so many landscape lighting ideas to choose from the possibilities are nearly endless with what you can do to brighten up your landscape. If you have additional questions on landscape lighting or your ready to start your next project, contact us today!